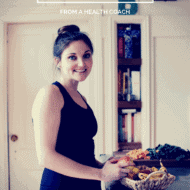 Tips and tricks from a health coach for how to get and stay motivated to eat healthy! 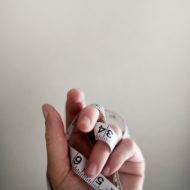 Set small, measurable goals that will help you get to your overall large goal. For instance – I will eat 5 servings of fruit and vegetables a day, incorporate leafy green veggies into 3 meals a day, drink at least 68 ounces of water daily, etc. Enlist support from your friends and family. Whenever I realize I need to get back to my roots and clean up my eats the first person I tell is Isaac because he then knows not to offer me sips of beer and chips. Keep nutritious foods on hand and ready to eat. Preparation is the key to eating healthy! Having fresh vegetables and fruits, lean protein, healthy fats and smart carbs each week is super helpful for staying on track. I like to make big batches of roasted veggies and brown rice or quinoa at the beginning of the week so I have healthy foods in the fridge ready to go for quick lunches. Keep tempting foods that trigger you to overeat out of the house. For me this is cereal, packaged trail mix, granola and other packaged foods. If the tempting foods are already in your house because someone else bought them, I’ve found that putting them away in a (high) cabinet is helpful. Out of sight, out of mind. Hopefully this little list helps give you some ideas on how to stay motivated to eat healthy. Like I said, everyone has off days and may not eat healthy ALL of the time, but it’s what you do 80-90% of the time that counts. Let me know in the comment section what tips you use to stay motivated to eat healthy. And if you liked this post, I will do another one with tips on how to stay motivated to workout! Great tips! I think one of the biggest things is not to get discouraged/unmotivated if you cheat every once in a while. I think a lot of people than just end up forgetting everything and thinking they have to be all or nothing. But if you let yourself indulge every once in a while, you won’t feel deprived and will end up being more likely to succeed! agree! yep that’s me.. I eat something unhealthy & feel like i failed & have to start over again which usually ends up with me eating more bad stuff .. I think getting into habits is a good way to eat right, try stuff that is good & good for you like yogurt in the morning, or celery with peanut butter for a snack. little things will add up & when you start to like those foods you’ll crave them. Well said @Derryck, it is not a good habit to eating more bad stuff..
@Brittany – These are really great tips and I’m also trying to do new stuffs! These are great tips Brittany! I love the one about trying new foods. I definitely need to continue to work on trying as many new and interesting foods as I can. I’m so with you on #4 – and I always figure that when I grocery shop, more than half of my haul should require refrigeration (or freezing, for frozen veggies and the like). Besides, fruits and vegetables are so delicious! #8 is a biggie I need to work on…I get so hungry then eat until I’m stuffed! If I use #11 and bring snacks for the afternoon to work, problem #8 solved. Oh, and I am excited for Modern Family too! I hope its as funny as last years Halloween episode! Thanks for sharing! It is so important to eat healthy. Am I going to see you at Foodbuzz? I’d love to meet the brilliant girl behind one of my very favorite blogs! I WISH!! I’m not going to be there this year. :/ You’re going to have a blast though – I’ve gone for the past two years and had so much fun. thank you for sharing this, i so needed it! i have fallen off the eat-right bandwagon and have been finding it difficult to get back on! Yes!! Chips are so easy to overeat – especially at Mexican restaurants where they keep bringing you more. Thanks for the post, I had been starting to slip up in my healthy eating routine as well. One of my tips to eat healthy 80-90% of the time is to keep lots of healthy options available in your own fridge/pantry. If I only have a few options, by the end of the week I am hitting up starbucks and other places for snacks because I am bored of my few options. But, by keeping variety in my diet I can usually always find something healthy I like at home. I need to get better about packing snacks with me on the go. I work long days in the mall (food court = NO healthy options) and also travel an hour to take college classes. I find myself hungry on the drive home, and passing up tons of fast food drive-throughs is not easy. Perhaps you could also do a post about healthy snacks (brands or homemade) that are great to pack for on the go? I always need new ideas. I definitely agree about keeping a variety of healthy things on hand so you don’t get bored with eating at home! And thanks for the post idea – I’ll definitely try to do one about healthy snacks. I love snacking so that’s right up my alley. Great list! I think #s 1, 11, and 13 are my favs. I do #13 all the time now! Going to Trader Joe’s today to try and fix that. Usually if I pick out some new foods then suddenly I feel so much better! I think being a part of the blogging community (even just reading blogs) can help you stay on track – you never run out of new, great ideas! Great tips! I think most people get on track, then after a splurge heavy weekend or busy week they feel like they have fallen off the wagon. The last tip is definitely one of the most important – splurge when you really want to, and just know you can use the strategies above to get back on track after a fun week! very smart list is the jumping point I was needed. I also appreciate the tip about going to the fridge instead of the pantry (also, NOT the freezer either where treats might tempt). That is one I haven’t heard before, but I think it’ll stick in my head. Like other people have said, having a community of healthy folks helps. Things I would never think to try have improved my diet and made food more fun — like putting peanut butter or pumpkin IN my yogurt. Man, that has kind of rocked my world (and my afternoon snack! ), so thanks for those fun tips! Great tips, Britt! I am in total agreement with you, especially when it comes to keeping nutritious foods on hand and keeping tempting foods out of the house. You rock! Oh thank you, thank you, thank you for writing this post! Since I’ve been having difficulties the past couple of weeks my diet has been pretty bad, I snack waaay too much and I’m starting to feel the consequences so I’m desperate to get back on track! Great tips! I especially struggle to eat healthy on the weekends, but I have been trying to keep in mind my motivations and the progress I’ve made so far. I don’t want all my hard work to go to waste! These are really great tips – I especially think it’s important to tell everyone you know! They can help and hold you accountable! So many great tips! I love it!! I find that keeping a food journal is one of the best ways for me to identify what I’m doing well and what needs more work. I also like that you suggested trying new foods. So important. I’ve been reading your blog for some time now, and I’m a big fan! This post came at the perfect time in my life! I was struggling with trying to find balance and to focus on my own well being, and the task seemed so daunting! Then, I read your post and I was inspired! I’m starting with setting small, measurable goals! This week, I will work out at least 30 minutes a day! I hope it is ok if I add your link in my own blog post? Great tips. I never leave the house without raw almonds in the 100-calorie packs. They save me every time. I do well most of the time, but I’m such a stress eater and I feel like I always sabotage my good efforts. Any suggestions? This post is great! very helpful, however I find the bit about keeping a food journal really tedious! I don’t know I find myself starting it and after about half a day dreading eating my next meal because I know I have to record it, I have some learning difficulties so I find it hard. That being said i need to keep or ill end up not knowing what I had. My boyfriend always asks me “what have you eaten today?” it really just a boring chore recording everything! But that’s just me! Has anyone any tips to maybe make it less of a bore? Do you realize that ‘boring’ is your state of mind? No one but you can fix that attitude. One solution is to ask yourself – why am I interested in better eating? Or the better question might be: Are you really interested in better eating? Nothing good can happen until you are HONESTLY determined to eat better – then it will work. Great post! Eating healthy in my opinion is the key to a successful diet. This can be your starting point and before you know it you will developed healthy eating habits. Now your able to keep the weight off with a little exercise of course. Keep up the great work your blog rocks!!! Thank you for your wonderful tips Brittany.It will definitely useful for me and my family. Instead of grabbing a bag of chips, get whole grains, fruits, and veggies. Your child will eat these foods when they could not find any junk foods in sight. Nice!!! This post is written in a very good way and entails a lot of useful information for me. I am glad to find a good way of writing the post. Hi Isra. 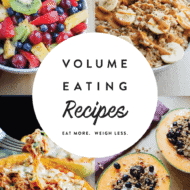 Which recipe are you referring to? I didn’t realize that eating something every 2-3 hours helps to keep your metabolism running. My wife and I are going to be starting a diet, and we want part of our diet to include eating healthier foods. We will look for providers of healthy foods and be sure to eat something every 2-3 hours as we go on a diet. There are so many ways to Stay healthier and still enjoying your food. Making the choice to eat healthily is to remove unnecessary fats, sugars, and carbs from your diet. Thanks For sharing these wonderful motivated tips to eat healthily. You’re doing a great job, Keep it up. Oh. I’ve searched a lot and finally you helped me out with more information. Helpful tips. These kind of blogs helps people a lot in understanding how maintain a healthy schedule. Thanks for sharing! 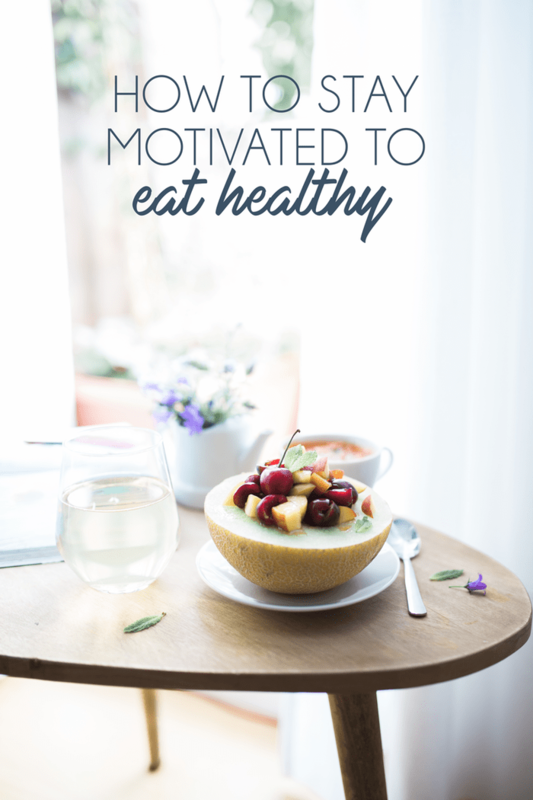 Great tips about how to get and stay motivated to eat healthy! Thanks for sharing these. Such an amazing article! Positive vibes only. I really like that all your tips are easy and doable. Maintaining food and exercise journal is the first I would try. Thank you.